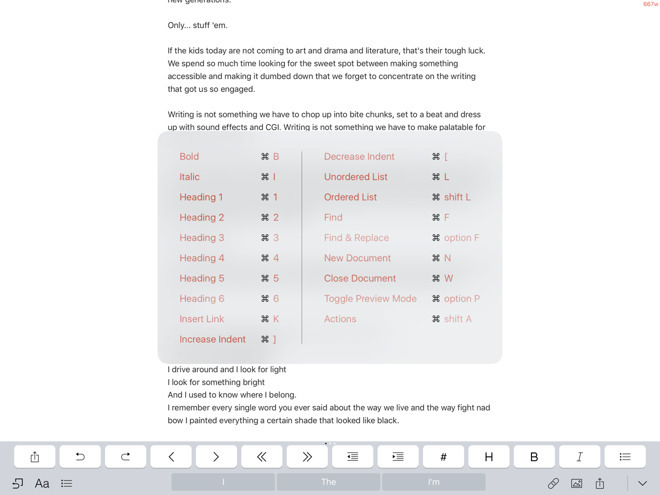 AppleInsider examines the latest update to 1Writer that brings improved keyboard functionality, plus Dropbox, and Markdown support to the iOS-exclusive writing tool. Apparently, the syllabus for "App Development 101" has every student making a note-taking app, at least after they've done a weather one. Of the hundreds or even thousands of apps you can write in, though, there are a few that rise to the top. Sometimes that's by familiarity such as Pages and Word, other times it's through a kind of cult popularity. So 1Writer 2.5.1 doesn't have users so much as it has fans. The fans will be pleased with the new updates which add welcome improvements such as a better Find and Replace system. There is also a new extra row of keys that appears onscreen. This is customizable but comes preset with keys for going through your text quickly, such as left or right a whole word at a time. 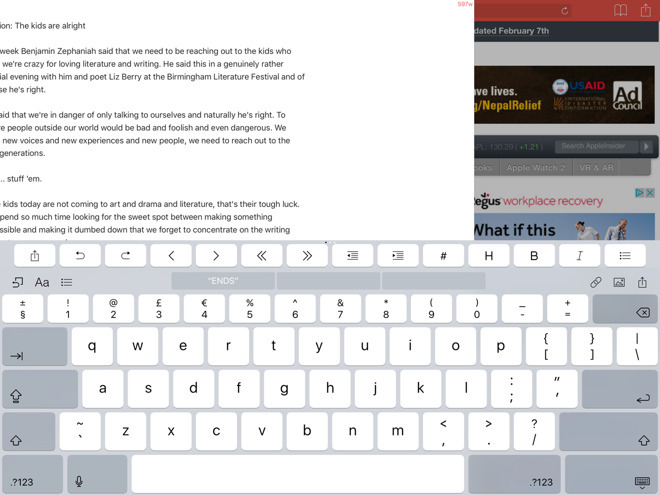 That same extra line appears onscreen even if you're also using an external keyboard - and 1Writer has improved support for those. Many more shortcuts have been added and you can see them all by holding down the Apple or Command key. Behind the scenes, this new version adds an update to make 1Writer work better with the latest edition of online file repository Dropbox. Dropbox is a key part of 1Writer. If you've never used the app at all, the quickest way to describe it is to say that it's a Markdown text editor that saves your work to Dropbox. Markdown is a system for specifying headings or just bold and italic but at heart it's plain text —and that is all you are going to be able to write in this app. While 1Writer lets you email PDF versions of your text, it won't actually save in anything but plain text. So you can't create Word documents, you can't even use RTF for preserving formatting in text. This used to be more significant when the entire world used Word, but you still need to think about who you're working with and what documents they may be expecting from you. 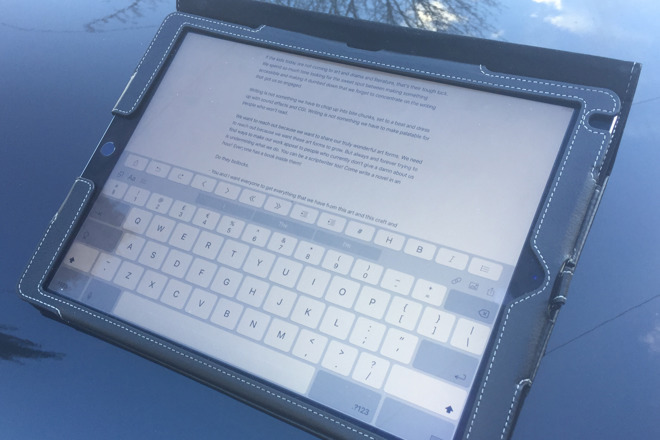 Today, when you can write your text in anything and then, say, open it in Apple's free Pages before saving or sending it on as Word, there is something more pressing. The most important thing when you're going to be writing a great deal is how the app feels. App feel is a hard thing to define. Microsoft Word, for instance, always feels like you're steering a container ship. Drafts 4 on iOS is a jet-ski. Apple's Pages feels like all its power is hidden away in secret compartments belowdecks. Ngoc Luu's 1Writer is closer to the fast and light end of the range, but sits more at speedboat than jet-ski. It's also got a built-in web browser. This is less useful now that iPad Pros, at least, can have Split View and so open Safari next to any app you like. In either case, when you paste text you've copied from a web browser, 1Writer automatically inserts it without any formatting. It would be good if pasting a block of text also pasted a link and citation to the original site, though. Also built-in is the option to use 1Writer actions that other users have created. So you can add the ability to send selected text straight from 1Writer to, say, the OmniFocus To Do app. The question with 1Writer lies less in whether it's good, more in where it fits in alongside alternatives. There's no Mac version of 1Writer, so you're going to have to find something else to write in at your desktop or laptop. If you need to include images in your text then 1Writer's way feels like a programmer's workaround: you save the images to Dropbox and the app inserts a link to the file into your text. That feels clunky but it does at least mean your documents will never get prone to crashing because they have large graphics embedded into them. If that's a compromise, then so is the potential need to convert 1Writer text into some other form for sharing with other people. No system where you have to use a second app to get a job done is exactly elegant, but it may be worth it for the option to write in a text editor that's a pleasure to use. 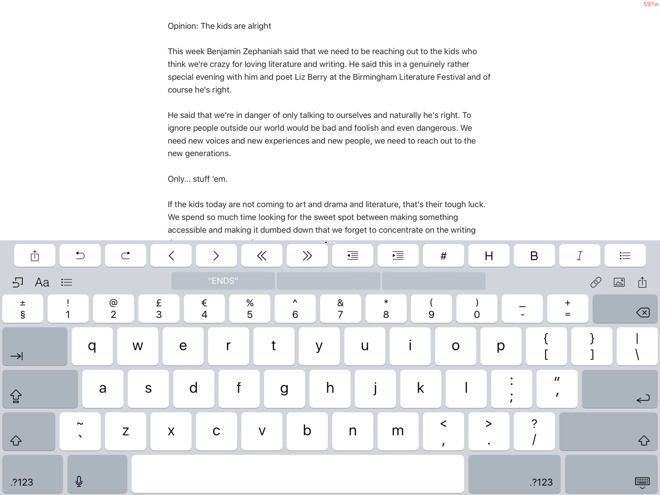 1Writer 2.5.1 requires iOS 9.0 or higher and costs $4.99 on the App Store.